The VK 168.01 (P) is a German tier 8 premium heavy tank. In the summer of 1942, Porsche received an order for a breakthrough vehicle with the most powerful armament and thickest armor possible for such a class. VK 168.01 was a further development of the Mäuschen project. The main difference was in the frontal placement of the turret. Existed only in blueprints. Basically a premium equivalent of the VK100P, the Mauerbrecher breaks the mold of recent premium tanks in that it is decidedly inferior to its non-premium counterpart. It has even worse mobility and its armour, while good on paper, is riddled with weak spots that can be exploited even by lower tier tanks. In particular, its machinegun port, which can be penetrated from almost any angle, is the bane of this vehicle. The only effective way to exploit the armour on the Mauerbrecher is by sidescraping a wall to the right of the tank. That way, the machinegun port can be covered up and even the commander's hatch will remain behind the wall. As a result, using the Mauerbrecher to lead assaults, even when top tier, is a guarantee for disaster. This tank is best used in the support role. Ideally, it should follow other tanks and use them to hide its hull. This leaves only the commander's hatch as a potential weak spot. Thanks to its hardhitting gun, the Mauerbrecher can be effective against higher tier vehicles, but its vulnerability only increases at higher tiers. This premium vehicle is fully researched. 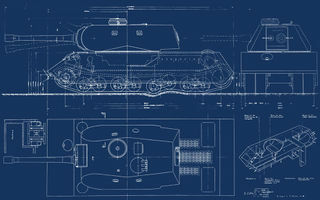 The in-game VK.168.01 (P) is based on an intermediate step in the development of the Maus, specifically the blueprint K.3384, dated to October 5, 1942. During the development of the Pz.Kpfw. VIII Maus, a redesigned blueprint was presented by Porsche on October 5th, 1942. By October 28th, blueprint K.3384 was ready. The mass of the tank increased only a little bit compared to the late June version, a mere 10 tons. The tank, however, changed beyond all recognition. The new turret had a larger turret ring, so the sloped sides had to go. the turret is now placed at the frontal of the vehicle. The hull resembled a box with a sloped rear and front. There was a new feature, a machinegun mount in the hull. Due to the longer and heavier hull, there were now 8 road wheels per side. For ease of service, instead of one wide track, there were now two narrower ones, like on the VK 40.01(P). In early November of 1942, the tank was reworked again. By November 14th, blueprint K.3385 (presented in-game as the Mauschen) was ready, where the turret moved to the rear of the hull. Similar metamorphoses happened to the Porsche Typ 180 heavy tank (VK 45.01(P)). Blueprint K.3384, October 5th, 1942. This is the basis for the in-game VK.168.01 (P). * The 15 cm guns proposed for this design, the 15 cm KwK L/31 and the 15 cm KwK L/37, are unavailable in-game. The armor of VK.168.01 were significantly decreased compared to the Mauschen for balancing reasons. This page was last modified on 14 September 2018, at 17:05. This page has been accessed 11,482 times.